I am reading The Victorian House by Judith Flanders. It is an absolutely fascinating history of Victorian life. I am currently enthralled with this piece of information. The Lancet reminded doctors that women patients complaining of exhaustion, or an inability to walk even short distances, were probably suffering from the loads they were carrying, rather than illness or the inherent weakness of being female. By the end of the century a fashionable woman was carrying thirty-seven pounds of clothing, although the Rational Dress Society had long campaigned for women to reduce their underclothing to a maximum of seven pounds. Thirty-seven pounds of clothes! The mind boggles. And seven pounds of underclothes was viewed as rational and was a reduction of what was usual. Thirty-seven pounds. Just think about it for a few minutes. Simply standing up would require a lot of effort. Women were also exhausted because their houses were deathtraps. This description emphasizes the point. The house was a dangerous place in ways we have forgotten. Painted walls were usually primed with two coats of lead, red and white; the top coat was then mixed into a base of white lead. This caused painters' colic, a type of paralysis, when the wet paint was absorbed through the skin. Wallpaper was no safer: many colours were produced by dyes made from various poisonous materials. Green papers were particularly dangerous, often having an arsenic base, as did lilac, pinks, a variety of blues, and 'French grey'; some wallpapers had as much as 59 per cent of arsenious acid in the paper. In addition, vermilion was adulterated with red lead. (Prussia, Bavaria, Sweden and France had banned these papers long before, but in the late 1880s they were still routinely used in Britain.) Arsenic in the wallpaper was one of the reasons that a 'change of air' often worked so well for invalids: those who were being slowly poisoned went to the seaside, leaving their poisonous paper behind; their health improved, and then on their return to the still-poisonous room they had a relapse. Isn't that interesting? I knew that the paint contained lead but I never made the connection between the lead and arsenic in the paint and wallpaper and the need for a 'change of air.' I always wondered why there was such a belief in the benefits of sea air. It all makes sense now. I haven't quite finished the book yet but I would recommend it. I enjoy books that give me a clear picture of what it would have been like to live in a different time period and this does just that. I am not usually interested in the big picture. I don't have a burning desire to know the political history of the time or to read descriptions of the architecture of the day. However, tell me how much a woman's clothes weighed and give me a list of what was viewed as absolutely necessary to set up housekeeping and I am guaranteed to continue reading. It seems amazing that some women even managed to play tennis at Wimbledon while carrying all that weight around! I believe William Morris made most of his money from the manufacture of cyanide, not worrying that the people working for him were at terrible risk from the poison. Plus, it would have been hard to breathe because of the tight lacing. I have no idea how they managed to play tennis. This sounds very good. I read a lot of Victorian novels but I have not read much about what life was really like for folks who lived at this place and time. The clothing always sounded ponderous, but 37 pounds is amazing! It was fascinating to merge the Victorian novels I read with the details of what life was really like. I think you would enjoy this. This book sounds fascinating. I remember taking Victorian Literature in college and I loved learning about the time period. I cannot imagine wearing that much clothing! I can't either. It just sounds so awkward and hot in the summer. It was a fascinating book and it goes well with an interest in Victorian literature. I'm happy you're enjoying The Victorian House so much Jennifer. These are especially fascinating excerpts-they also remind me of The Hidden Killers BBC series. 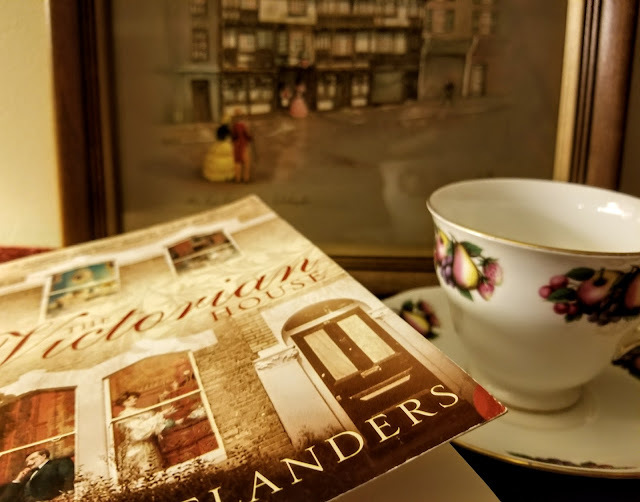 I can't wait to read this, and I also have The Making of Home: The 500-Year Story of How Our Houses Became Our Homes by Judith Flanders waiting on my shelf. Thank you for reviewing this! I have this and several others she wrote on my list but have not read yet. However, I did read the mystery she wrote not long ago, A Murder of Magpies. I liked but did not love; I think the heroine just didn't appeal all that much although she was a book editor and thus (presumably) congenial.